CF Industries, Terra Nitrogen, and CVR Partners just can't seem to catch a break. 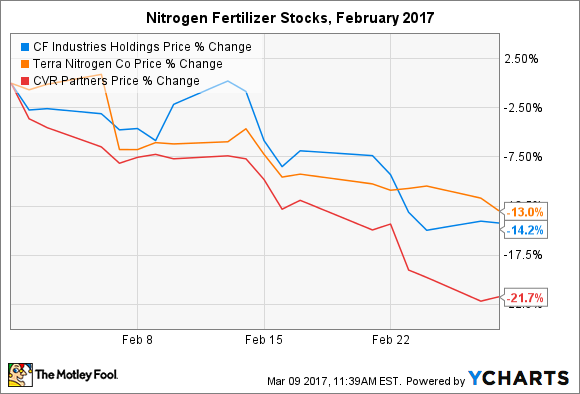 Shares in three of the leading nitrogen fertilizer producers dropped last month after a round of disappointing earnings announcements. Performance continued to be complicated by a lingering global surplus of major nitrogen products, namely ammonia and urea ammonium nitrate, or UAN. CVR Partners (NYSE:UAN) dropped 21.7% after reporting its first ever annual operating loss -- not exactly a winning formula for a master limited partnership designed for the sole purpose of returning the bulk of its profits to investors via eye-popping quarterly distributions. CF Industries (NYSE:CF) and Terra Nitrogen (NYSE:TNH) didn't perform much better, down 14.2% and 13%, respectively. The former owns a 75.3% stake in the latter. The fertilizer industry is historically cyclical, and as investors are well aware, currently stuck in a down cycle. While executives throughout the industry have signaled to investors that better times are now within reach in the back half of 2017 and 2018, the recovery for nitrogen products continues to lag potash and phosphate nutrients. The situation appears to be the worst for CVR Partners. Operating cash flow has now been lower than the amount of dividends paid for two straight years. In 2016, the gap was over $25 million, which explains why the company has decided not to make a distribution to shareholders for the last two quarters. It also skipped a distribution at the end of 2015. Worse yet, performance in the fourth quarter actually trailed that of the third quarter. While revenue was higher in the final period, investors were forced to deal with deteriorating gross margin and earnings per share (EPS) despite higher selling prices. The substantially larger CF Industries has managed to weather the storm much better, although market conditions have still taken their toll on shareholders. Operating cash flow remains well above dividend payments, which means investors don't have to worry about the potential for dividend cuts. That said, operating cash flows in 2016 were about half of historical levels. The company reported a net loss of $277 million for the full year, but that soars to an adjusted net income of $109 million if non-cash impairments are excluded. Weak selling prices in 2016 offset record exports and resulted in the fourth-straight year of declining revenue. Terra Nitrogen found itself in a similar situation as its parent. The master limited partnership grew production volumes from 2015, but still saw a year-over-year revenue drop of 28%. However, it reported net income of $209 million -- a strong performance relative to its peers -- and had more than enough cash to cover a small gap between operating cash flow and quarterly distributions. Investors shouldn't count on that being a sustainable practice. Where are things headed from here? All three management teams admitted that headwinds will persist throughout 2017, but a significant reduction in Chinese exports to the U.S. market should provide strong support for prices in the first half of the year. The bad news is that new production facilities coming online in North America will help the American and Canadian markets lower their export dependence, which stands at approximately 44% of total nitrogen demand. That provides uncertainty for prices in the second half of 2017 and beyond. All three companies would enjoy a healthy rebound if the global imbalance between nitrogen supply and demand found an equilibrium. Diversified CF Industries and low-cost Terra Nitrogen are the best positioned to capitalize on a recovery, while CVR Partners will likely remain constrained by its higher cost production process. Of course, while signs point to the possibility for short-term relief in the first half of this year, the industry will add more supply throughout the year. That's the same issue that led to the current down cycle, and shouldn't exactly strike confidence in long-term investors.